The ionization of the DNA single and double helices (dA)20, (dT)20, dAdT)10. (dAdT)10 and (dA)20. (dT)20, induced by nanosecond pulses at 266 nm, is studied by time-resolved absorption spectroscopy. 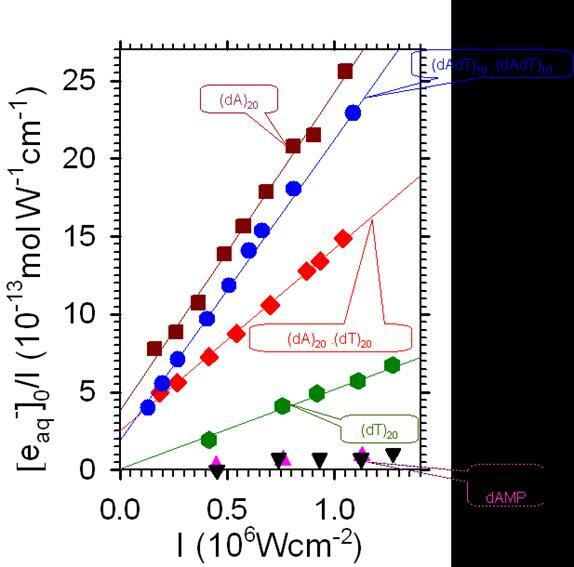 The variation of the hydrated electron concentration with the absorbed laser intensity shows that, in addition to two photon ionization, one photon ionization takes place for (dAdT)10(dAdT)10, (dA)20(dT)20 and (dA)20 but not for (dT)20. The spectra of all adenine containing oligomers at the microsecond time-scale correspond to the adenine deprotonated radical formed in concentrations comparable to that of the hydrated electron. The quantum yield for one photon ionization of the oligomers (ca. 10-3) is higher by at least one order of magnitude than that of dAMP showing clearly that organization of the bases in single and double helices leads to an important lowering of the ionization potential. The propensity of (dAdT)10(dAdT)10, containing alternating adenine – thymine sequences, to undergo one photon ionization is lower than that of (dA)20(dT)20 and (dA)20, containing adenine runs. Pairing of the (dA)20 with the complementary strand leads to a decrease of quantum yield for one photon ionization by about a factor two.